Great retro cushions come along pretty often (we seem to feature at least one a month), but this is the best I’ve seen in a while. 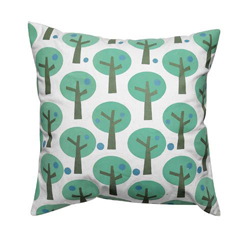 Simply described as “Retro Green Cushion Cover”, it has a distinctive green tree print on a white background. The design looks very Scandinavian and the colours are fresh and spring-like. It costs £10.99 which is just for the cover. You’ll need to fill it with your own 45cm x 45cm cushion. It is being sold by The Contemporary Home who do a surprising amount of retro products considering their name!